The company also issued weak guidance moving forward, making it the latest video game giant to wrestle with a disappointing earnings report. While Activision Blizzard saw record revenues of $2.84 billion, it missed on analysts’ projections of $3 billion. The company also reported next-quarter guidance of $1.18 billion, below expectations of $1.48 billion. For game makers, single titles can mean fortune or famine, and the ever-popular “Fortnite” continues to win the battle for gamers’ attention. “There are no more ‘B’ titles…gaming is now a world of ‘As’ and ‘Ds’,” Morgan Stanley analyst Brian Nowak explained in a recent research note. But streaming services and new consoles expected in the coming years could offer hope for struggling gaming companies. And, as IDC analyst Lewis Ward warns, it’s important not to confuse short-term volatility in a few stocks with long-term company or industry trends. Activision Blizzard — the company behind mega hits including the “Diablo” franchise, “World of Warcraft,” “Call of Duty,” and “Overwatch” — has seen its monthly active user numbers shrink from 384 million in Q3 2017 to 345 million in Q3 2018. And while the company’s “Call of Duty: Black Ops 4” sold well, it didn’t live up to expectations set by earlier entries in the series. “Overwatch,” Activision Blizzard’s long-running competitive multiplayer game, also had problems as monthly active users remained flat from Q2 to Q3. The company’s King division, which produces those incredibly addictive “Candy Crush” games, saw its monthly active users drop through six consecutive quarters from 314 million in Q2 2017 to 262 million in Q3 2018. Then there was Activision Blizzard’s split from developer Bungie, the company behind “Destiny 2,” following lower than expected sales of that game’s expansion, “Destiny 2: Forsaken,” which put a dent in Activision Blizzard’s revenue potential. While movie studios can afford a flop or two, gaming lives and dies by blockbusters. Games cost millions of dollars and years to develop, and those that don’t live up to expectations can strike a major blow to publishers or developers. Electronic Arts, known as EA, ran into a brick wall on Feb. 5 when it released its Q3 2019 earnings. Its big holiday season release, “Battlefield 5,” sold 1 million fewer copies than originally expected, while revenue came in at $1.17 billion against analysts’ expectations of $1.47 billion. “Battlefield 5” was supposed to feature a “Fortnite”-style battle royale mode, but after multiple delays, EA launched the title without the feature while saying it’s coming soon. After the sales and revenue misses, EA’s stock plummeted by its largest amount in more than 10 years. The company also reduced its fiscal year 2019 earnings outlook. The same day EA announced its earnings, it launched its free-to-play title “Apex Legends.” After a few days, more than 25 million people had downloaded and were playing the game. EA’s stock quickly cleared its previous losses on the news. EA also has a long track record of success, which is why Ward warns against seeing its recent bad luck as an indicator of its overall health. Take-Two Interactive, meanwhile, is facing scrutiny after releasing lackluster projections for its next quarter’s earnings. The company, which publishes the “Grand Theft Auto” and “Red Dead Redemption” franchises, is one of the masters of pulling long-term revenue out of its games with “Grand Theft Auto Online,” the online component of “Grand Theft Auto 5,” earning billions. 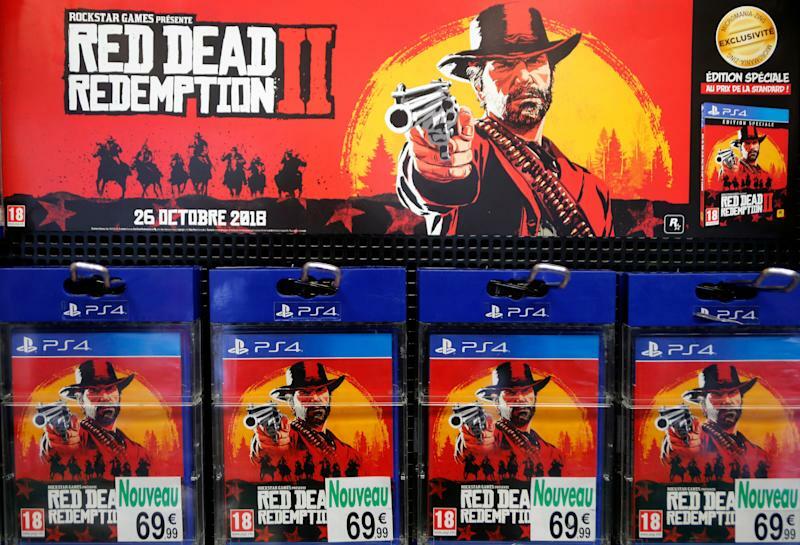 The fear now is the company’s latest game, “Red Dead Redemption 2,” won’t see the kind of revenue “Grand Theft Auto Online” had until some time in the Take-Two’s 2020 fiscal year. But not everyone is buying that narrative. Piper Jaffray analyst Mike Olson said “Red Dead Redemption 2 Online” could be huge for Take-Two. Game companies are also contending with the 800-pound gorilla in the game room, and I’m not talking about Donkey Kong. Epic Games’s “Fortnite” is dominating the gaming market and rewriting how developers and publishers put titles together. It’s also being blamed for lagging game sales. “Fortnite” pushed the battle royale subgenre of multiplayer online competitive gaming into the stratosphere. Activision Blizzard’s “Call of Duty: Black Ops 4” was praised for its battle royale element, but the game’s $60 cost, as opposed to “Fortnite’s” free-to-play model, ensured that “Call of Duty” wouldn’t get as many gamers on board as its biggest competitor. Epic Games, meanwhile, has been raking in the cash, as players spend money on in-game purchases for cosmetic items for their characters. The popularity of “Fortnite” isn’t going to last, though. The game’s hype will eventually begin to peter out, and a new kind of subgenre will capture gamers’ attention. And there’s a reason games companies like Activision Blizzard, EA, and Take-Two are some of the biggest in the industry: They offer some of the best games on the market. Macquarie Capital analysts Benjamin Schachter, Ed Alter, and Angela Newell point to several positives that could help boost game companies in the coming months and years ahead. Such advancements include new consoles from Microsoft and Sony in 2020, game streaming services and increases in mobile gaming. These companies might be going through a rough patch at the moment, but like any good game, they’ll likely earn an extra life and move forward.